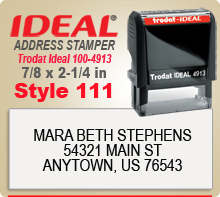 Order Name Address Rubber Stamper, Ideal Trodat 100 4913 Ink Stamps from our site. Creative Font Layouts built right in. Rubber Stamps for Printers, Mail Stores and more. 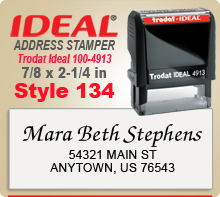 We have been a proven reliable source since 1974. Address Rubber Stamp layouts Simple Easy Fast! Order Today! Ships in 1 Day. 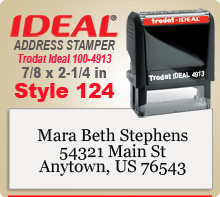 Get your Trodat Ideal 100 4913 and other sizes here quickly and online.